What you see in this photograph is a view of much of the Paisley Town Centre Conservation Area. Designated Conservation Areas are areas considered crucial to the conservation of our environment. There are over 600 conservation areas in Scotland. They are areas of special architectural or historic interest, the character or appearance of which it is desirable to preserve or enhance. Renfrewshire Council has been actively working on the Paisley Town Centre Conservation Area for some years, promoting conservation and good practice and finding ways to enhance it. I took this photograph from the roof of the tower of Paisley Abbey one Doors Open Day. 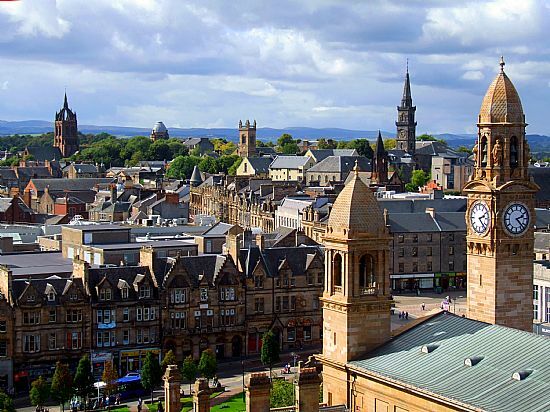 The towers in the foreground are of Paisley Town Hall, an “A” listed building by George A. Clark. To the left one sees the spire of the amazing Thomas Coats Memorial Baptist Church by Hippolyte Blanc. Next on the skyline is the dome of the Coats Observatory behind the museum. What I think is most significant in such scenes is the way they show that townscapes can be varied and even have some more assertive buildings within them, but can also contain a unity in character and a sense of place. Just one abrasive inappropriate intervention into that scene can destroy it.